You know me and entertaining, I kind of like it! 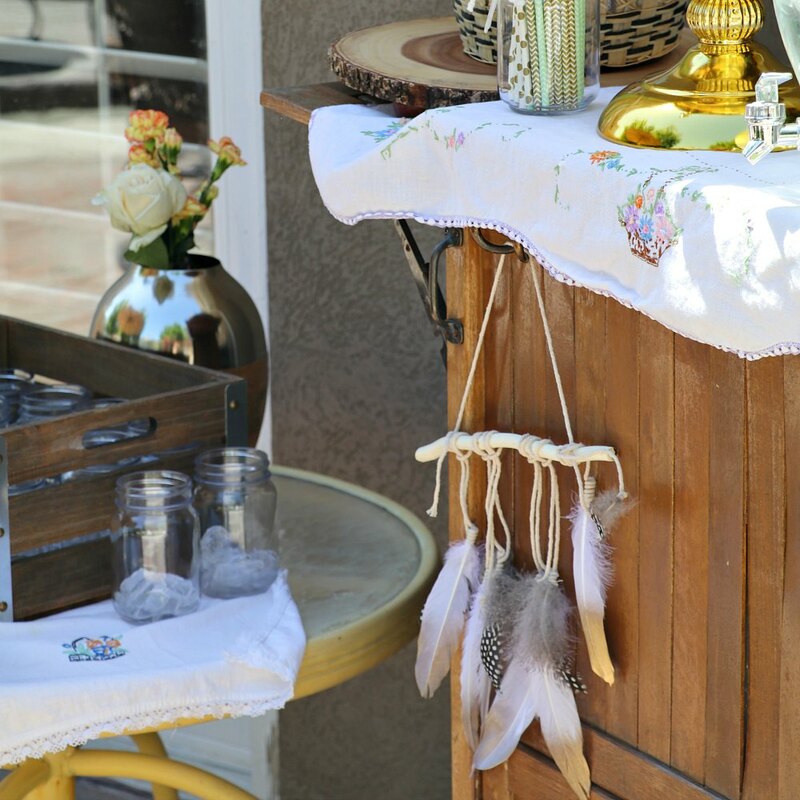 But when the weather turns nice enough to entertain outdoors, seriously I could throw a party weekly. 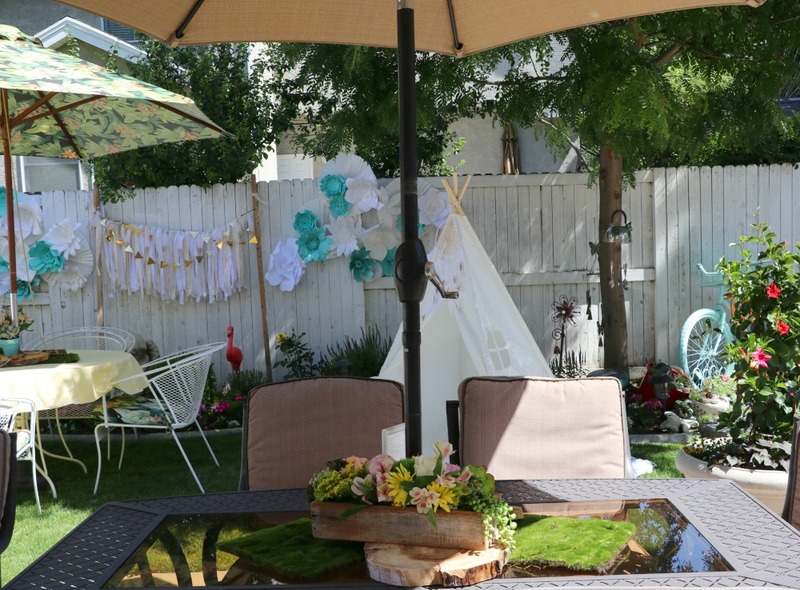 When my cute daughter asked if she could host a baby shower at my home in June, I immediately thought garden shower with Bohemian Theme all the way. Tori sent out invites with TeePee’s on them which set the tone right off. 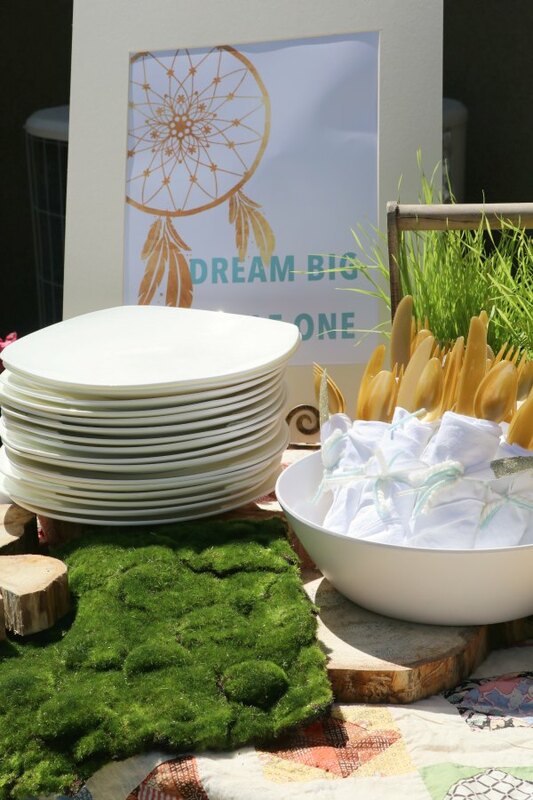 When I entertain outdoors I like to keep it as casual and informal as possible, I mean a garden party kind of speaks for itself, right??? 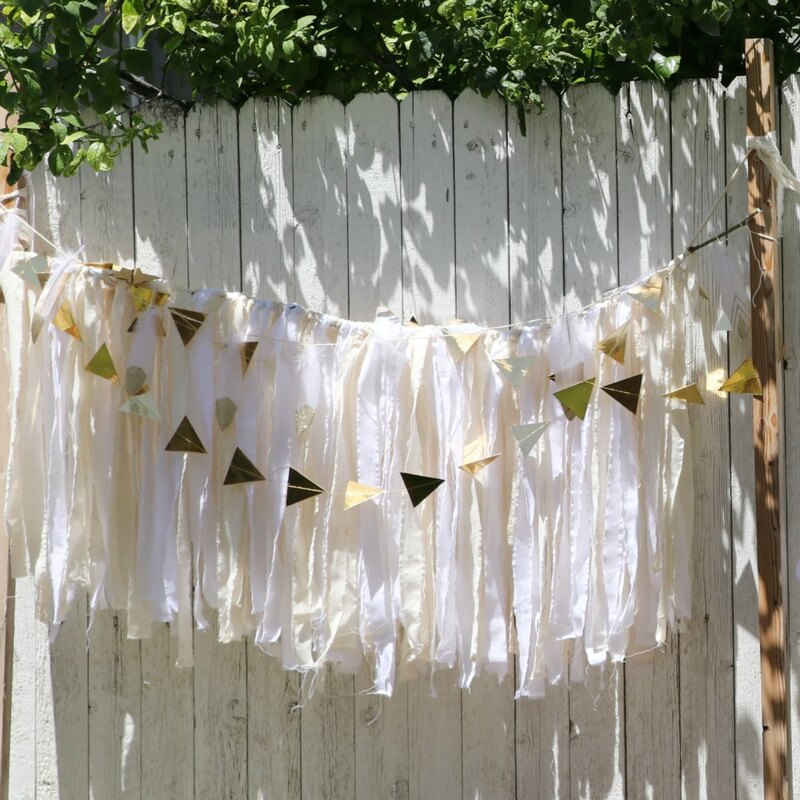 With the Bohemian theme in mind we wanted some kind of focal point to set the mood, therefore we created a home made banner which we tied to tree stakes and simply set them in the flower bed. 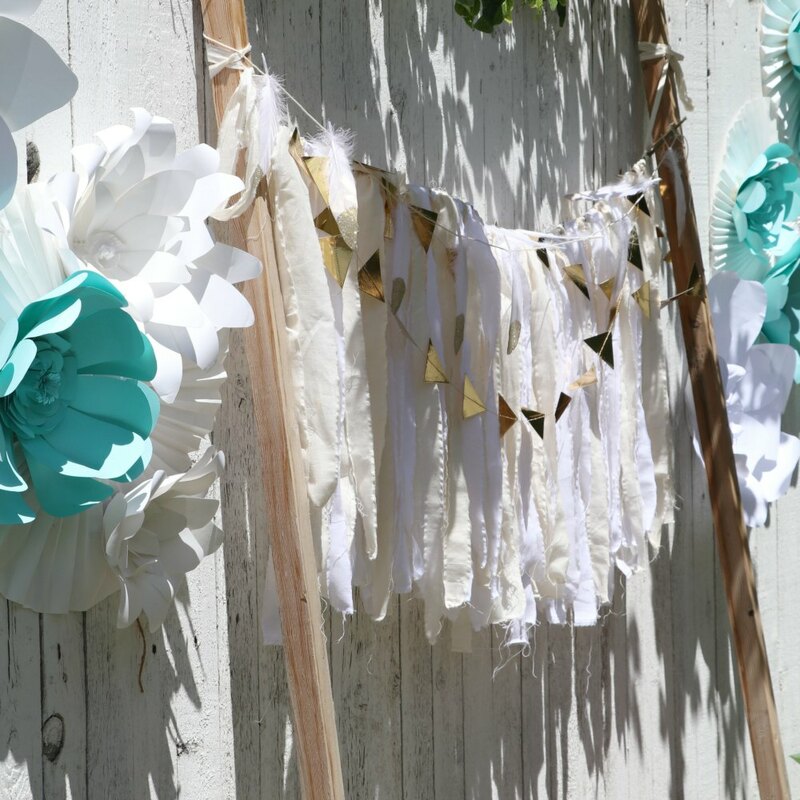 Along with huge home made paper flowers which we simply thumb tacked in the fence. 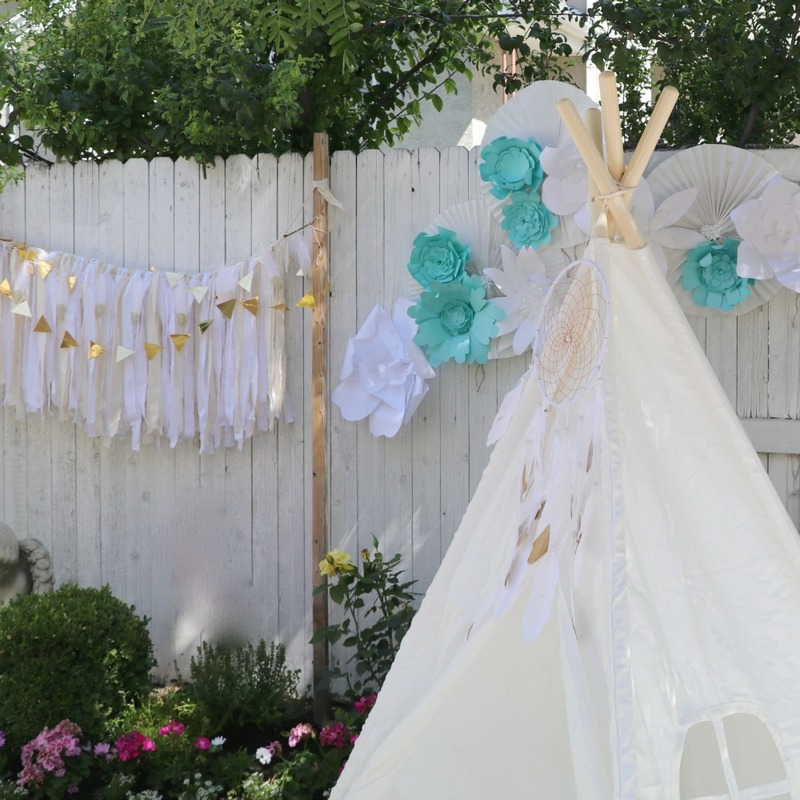 The other focal point we used was setting up this adorable tee pee, which was our gift to the momma. 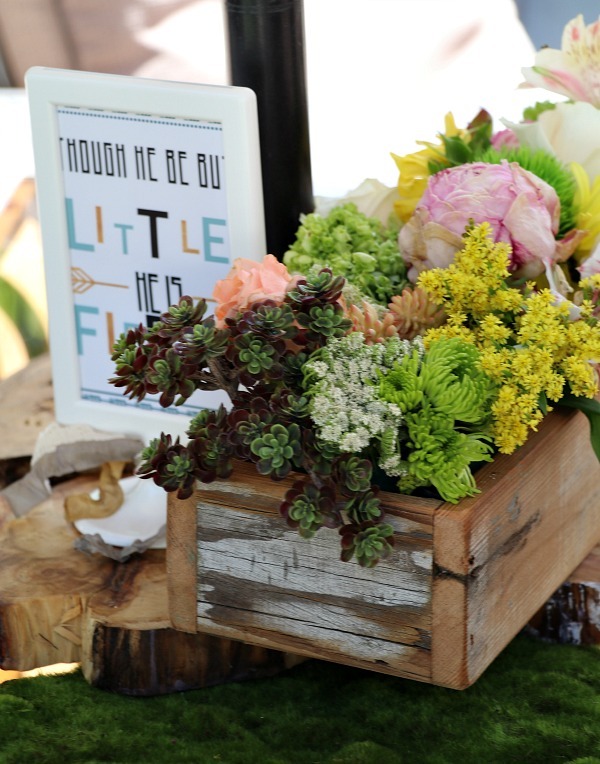 As each guest arrived we placed their gifts inside the tee pee. When it was time to unwrap gifts the cute little momma to be sat on the blanket in the teepee surrounded by her friends. 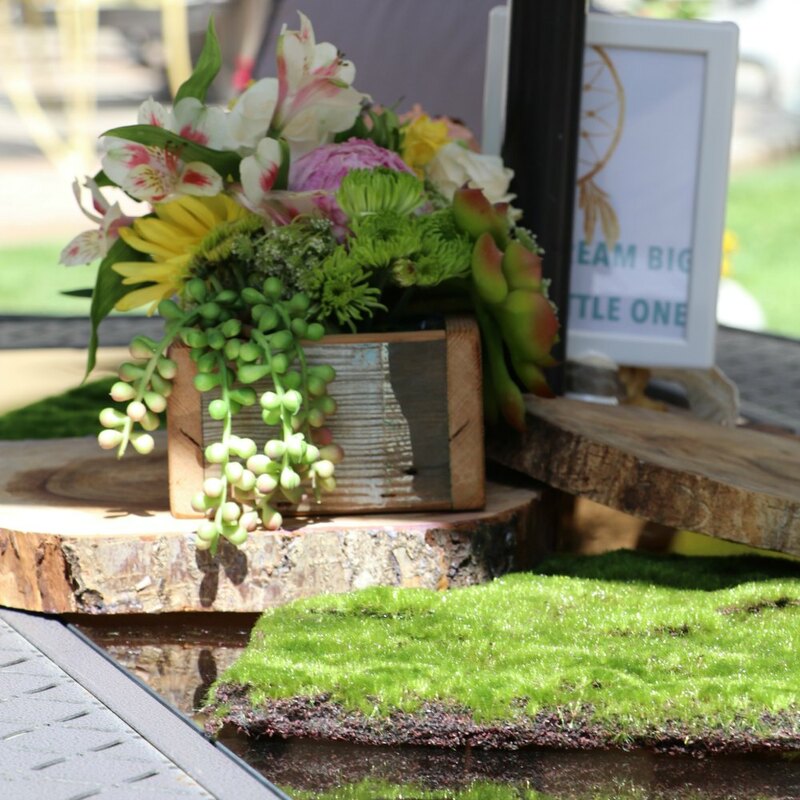 We kept the other decor as earthy and bohemian as possible . 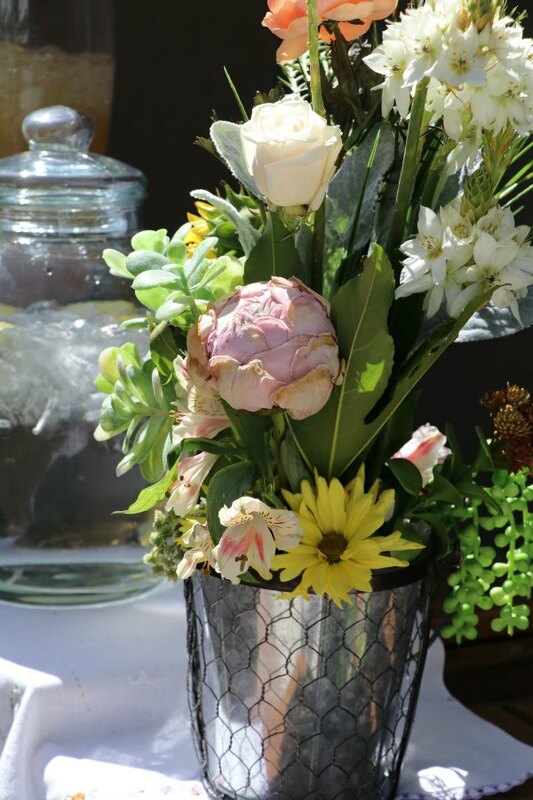 . .
By using wood crates and metal vases and then creating fresh flower arrangements which we placed on the eating and serving tables. I also created two pictures or sayings to carry on the theme: one said “though he be but little, he is fierce” and the other was a huge dream catcher saying “dream big”. I printed off an 11×13 and a 10×8 of each and a few 4×6 which a framed and placed on varies tables. 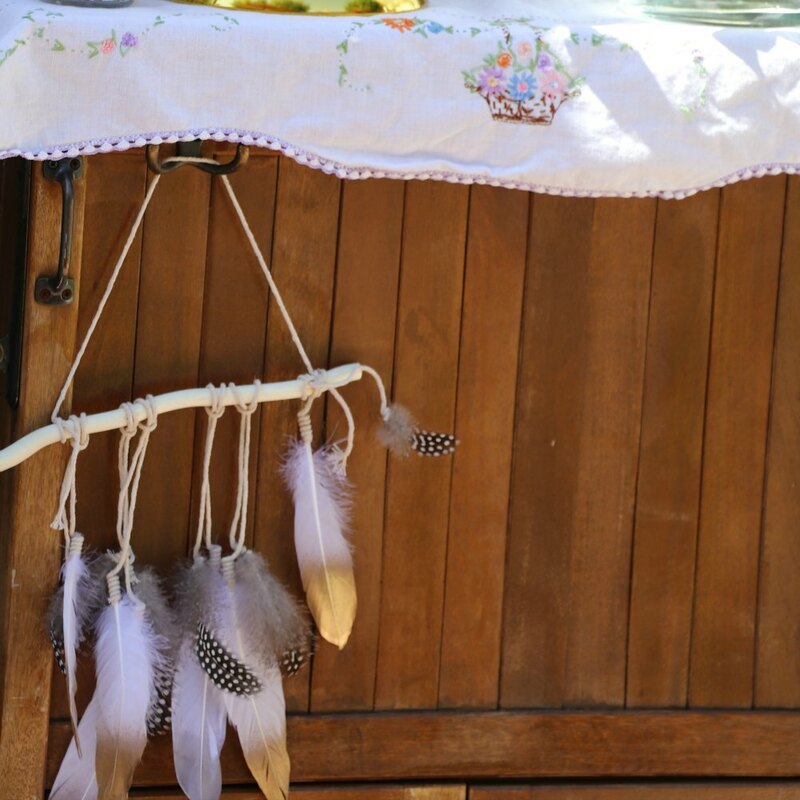 We placed dream catchers here and there throughout the tables . 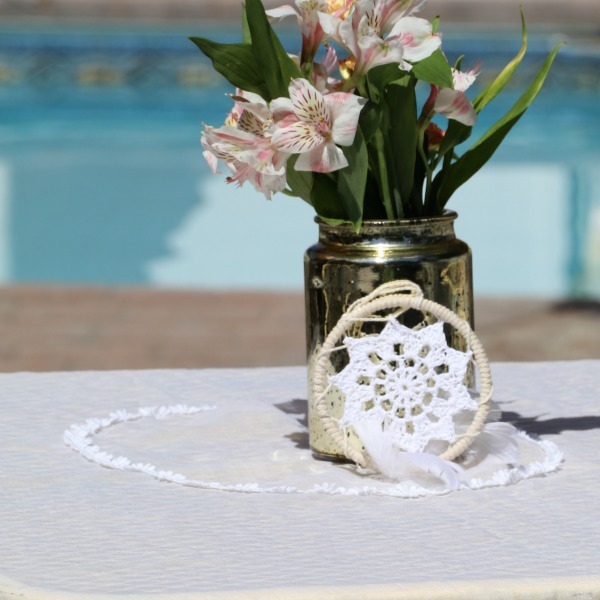 . .
And on the serving tables I used a few of my grandmothers vintage quilts which went so well with the theme. 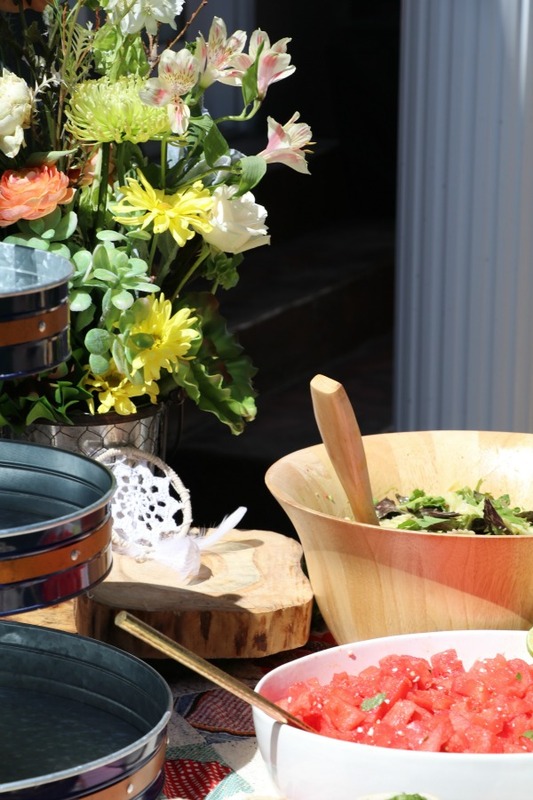 We kept the meal light and refreshing, serving mini sandwiches and two of my favorite summer salads: a berry pasta and a watermelon salad. And as promised I’ll share these with you, I have no doubt they will become your favorites as well. 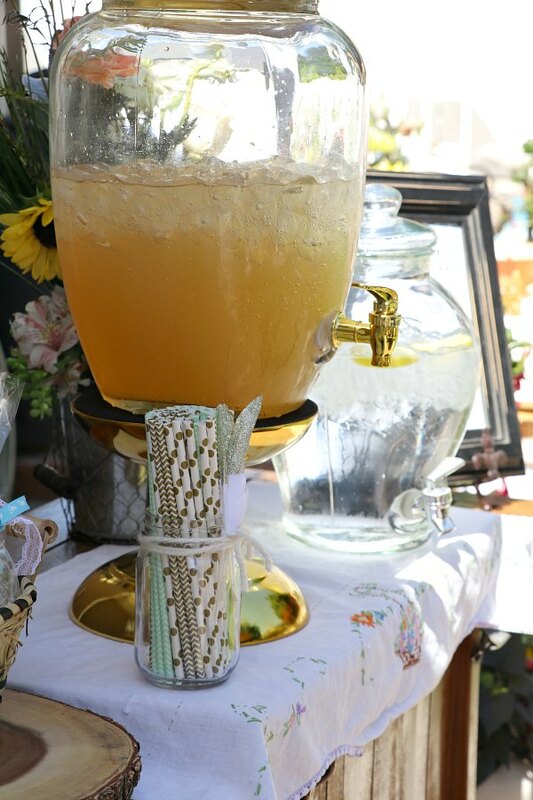 *I normally try to keep the drink station separate from the food station so its easier to go back to. We chose to serve homemade mint juleps (yes, I’ll share this recipe also) and of course water with some lemon and mint. I chilled mason jars with ice in the fridge and brought them out right before guests arrived so they would be as cold as possible. Some of you have asked if I ever use paper plates or products and my answer is, of course, but not too often. This time around I did use plastic utensils which I tied into vintage napkins with yarn (carrying on the theme) and my white china plates. 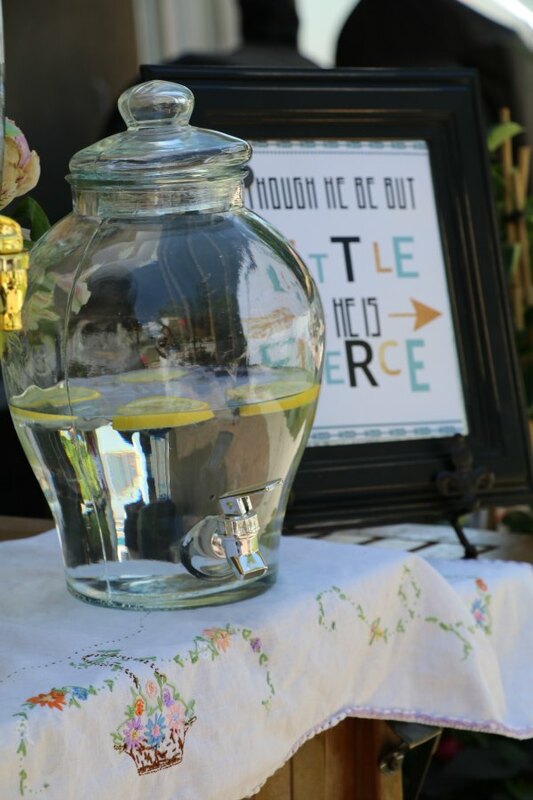 It was fun to mix mason jars with china. For the dessert, Tori made homemade strawberry short cakes which she put in individual mason jars that also had yarn tied around them. (where is the picture silly me). And last but not least, the take home treat . 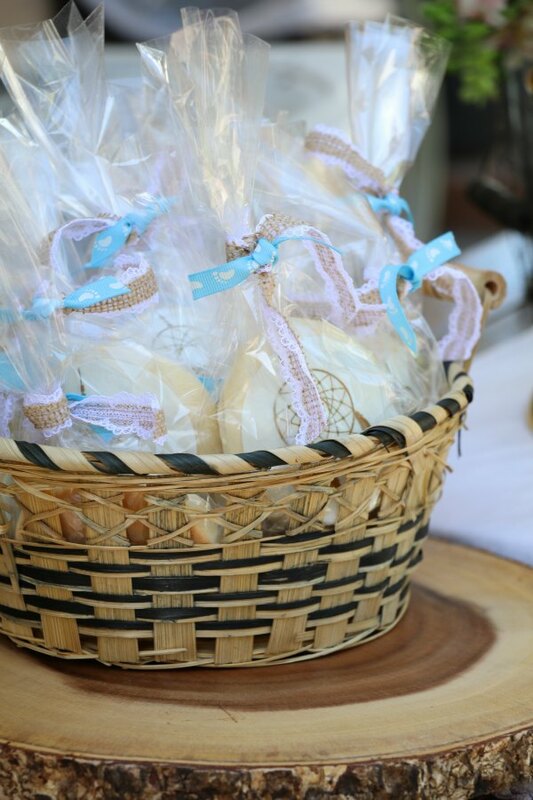 . .
Sugar cookies which we had stamped with a gold dream catcher. It’s always a wonderful treat to shower a new momma to be . . .
As always my friends thanks for dropping by. In sauce pan combine sugar, water, lemon rind and boil 5 minutes. Remove from heat and stir in lemon juice. Bruise mint to release juice then add to saucepan and stir. Let mixture sit for several hours and then strain. To make drinks fill tall glasses with 1/2 ice, add 2-3 tablespoons of syrup per glass and fill with ginger ale. Garnish with mint leaves, raspberries, lemon or a cherry. *I normally make a huge pot of syrup and then freeze it into mason jars and then pull one out for a party or dinner time. Cook pasta as directed on package (I normally cook it one minute less than directions) and after cooking give it a good ice bath and toss with either olive oil or better yet a tablespoon of the home made dressing. Place the pasta in a zip lock until ready to toss the salad. Wash and drain berries as well as salad mix. *this can all be done way before serving so it’s so easy to hurry and toss it right before guest arrive. Throw all ingredients in a blender and blend for maybe 10-15 seconds or until well blended and then pour into a container and refrigerate until ready to toss. Chop watermelon into 1 inch chunks and drain in a colander. In a small bowl, whisk together olive oil, fresh lime juice, salt and pepper to create a dressing. Place watermelon in a large salad bowl. Pour dressing and chopping mint over the watermelon and toss gently to coat. Pour feta into the salad bowl and stir to integrate the cheese into the salad. *I usually toss just a tiny bit of white balsamic vinegar also but its not necessary. Thanks for taking the time to share the recipes. I need to try that mint julep one. What a beautiful shower! She is one lucky momma to be! Babyshower? Is Tori expecting another baby? Ha, Heavens No! She was throwing the shower for one of her friends. Tori definitely has her hands full right now.